It goes without saying that, for the past 50 years, there's been a bevy of confusion surrounding the events of JFK's assassination. Much of it has stemmed from inconsistencies in his medical records, which have long been employed to justify errant conspiracy theories putting responsibility for the fatal shot in the hands of everyone from Fidel Castro to Lyndon B. Johnson. Today, prominent forensic pathologist Werner Spitz argues that the JFK autopsy was a bungled mess, although he maintains that the assassination was the work of lone shooter Lee Harvey Oswald—a theory that has survived the test of time, despite repeated investigations into the matter and an overwhelming dose of skepticism. In retrospect, the chaos of the autopsy room is not entirely surprising, as you'll gather from the following entries. At the very least, the medical data is difficult to make sense of, so it's no surprise that the events of Nov 22, 1963, have given birth to conspiracy theories that nearly beg to be told. Let's look back at some of the medical facts that have fostered the past fifty years of confusion. The autopsy was conducted at Bethesda Naval Hospital, where the two surgeons in charge—James H. Humes and J. Thornton Boswell—were both anatomic pathologists. However, neither of them had much experience with autopsies investigating unnatural causes of death. Thirty minutes into the procedure, they were joined by forensic pathologist Pierre Finck, who was, on paper and in title, qualified for the job. But Finck had spent his time reviewing autopsies and hadn't done one himself in two years. The band of bumbling pathologists had also likely been influenced by spectator accounts and circumstantial evidence that was floating in the ether: that there had been 3 shots fired, that the President had fallen forward on impact, that a rifle barrel had poked out of a nearby window. 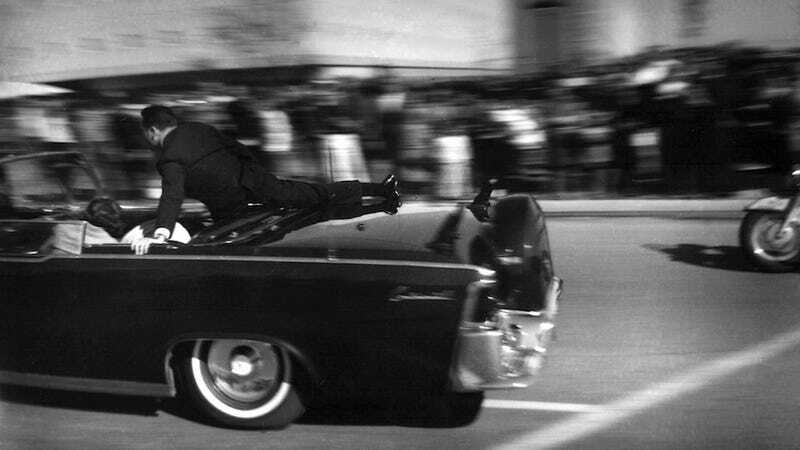 The problem, of course, is that much of this was frenzied speculation, and as it turns out, the footage captured by Abraham Zapruder indicated that JFK had actually fallen backward and to the side. It certainly didn't help that, as Spitz pointed out, forensic pathology was just beginning to find its footing at the time. There were conflicting accounts as to whether or not JFK was shot from front, from behind, or both, and whether or not that implied there may have been more than one shooter. (Cue the conspiracy theories.) The autopsy report seemingly answered this question, stating that two bullets punctured JFK from behind, as evidenced by their exit wounds. One was the fatal shot to the skull, while the other supposedly hit JFK's back and then exited through his throat. But this theory was flawed: the back and throat wounds both looked like points of entry, lacking the "skin wounds that are irregular, stellate, with slit-like margins" that were usually symptomatic of exit wounds. Stranger yet, the pathologists may not have been aware of the throat wound until after the autopsy was complete: they claimed that an emergency tracheotomy, performed in the hospital where JFK was treated, shrouded what could have been an entry or exit site for the bullet. And so their conclusion in the autopsy report, that the bullet "presumably" exited through the throat, was a strong guess rather than a decisive finding, complicated by the emergency tracheotomy that had been performed. The second and fatal shot, which hit JFK square in the skull, was almost certainly shot from behind. Here, the evidence is very compelling due to what's called "beveling": when a bullet hits a surface such as glass, it leaves a "crater" in its wake, which yields solid proof of entry & exit based on the nature of the damage. JFK's skull showed cone-shaped beveling in the back and an "outward-oriented beveled cone" in the front of his skull—that is, the bullet came in from the back and left through the front. But these findings are based on the assumption that the pathologists correctly identified fragments and reconstructed JFK's skull accurately, a level of competence that Spitz and others have since called into question—and perhaps even the Zapruder film. During the more recent investigation in the nineties, Humes admitted that certain standard procedures were left out of the autopsy, including the removal and weighing of individual organs. (Previously, Finck had also testified, saying that the pathologists were not allowed to do a full dissection of the back and throat regions, which was somewhat suspect.) Humes also let slip another minor factoid: that the "original" handwritten copy of the autopsy report in the National Archives is... not actually the original. The true original was a bloodstained document that Humes couldn't bring himself to look at, so he made a copy and tossed the original in the fireplace. When asked if he might have left anything out of the copied document, he responded with a very reassuring, "I don't think so." When Humes was shown photos from the autopsy during his deposition, he found it difficult to glean much from them. This is a point that's been made repeatedly: that the photo evidence cannot clearly identify the number of bullet wounds or the nature of them (such as entry versus exit). Some evidence even points to the disappearance of certain photographs: the government worker who processed the autopsy film was asked, in the last investigation, to identify the photographs from the National Archives, but she couldn't recognize them. The photos that she recalled were "pristine", she said, and didn't capture any blood or opening cavities. She even noted that the photo paper that the National Archives' photos were printed on was different from that of the original autopsy photographs she handled.